4" x 4" Woven Wire Sheep & Goat Fence - Smaller spacing provides strong confinement and deters sheep and goats from putting their heads through the fence. The smooth side of the "s" knot prevents injury to animals and the potential for injury is minimzed by flexing upon impact. With class 3 galvanized coating, this fence resists rust and lasts 20-40 years. Solidlock Woven Wire -Solidlock woven wire fence gives excellent control for sheep and goat containment. Graduated spacing (smaller at the bottom) provides superior predator protection. The combination of high-tensile wire and solid vertical lines allows you to use up to 25 foot post spacing. Class 3 galvanized coating provides 20-40 year life. 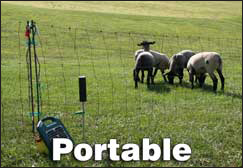 Portable Sheep & Goat Electric Netting - The perfect sheep fencing for rotational grazing and predator protection. Step-in posts are built into the fence so it's fast and easy to install or move. This netting can be electrified from an existing electric fence or powered by battery or solar energizers. High-Tensile Wire - Low cost, easy to install and maintain and can be electrified for ultimate control of sheep, goats and predators. With class 3 galvanization, this wire will resist rust and last up to 40 years. 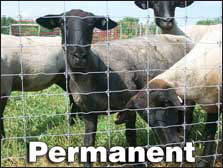 Learn: See videos on how to install portable sheep fencing. Save: Steep discounts on closeouts and clearance fence products.